Acoustic Cleaning encompasses the realm of sound transmission through solids. It is best described by the creation of rapid pressure fluctuations. These pressure fluctuations are transmitted into the particulate matter or "bonded" dry material causing the solid particles to resonate and dislodge from the surface they are deposited on or bonded to. Once dislodged, the materials fall, either due to gravity or are carried away by the gas or air stream within the process. The powerful sound waves are produced when the short bursts of standard plant compressed air enter the wave generator and force the only moving part, an aerospace grade titanium diaphragm to flex creating the powerful "base" sound wave. This "base" tone is then transmitted by a range of different bell sections into selected fundamental frequencies between 60 – 420Hz for the Audiosonic Range or between 11 – 25 Hz for the Infrasonic (PIS) Range. Primasonics Acoustic Cleaners comprise a wave generator and resonance section or amplifier. The wave generator may be either within the audible PAS range or within the lower frequency inaudible PIS range. 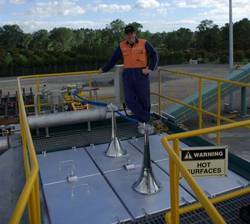 Primasonics exclusive Australasin agent, Bulk Materials Handling Pty Ltd, provide detailed on-site process evaluation and will quickly identify the correct Acoustic Cleaning system to solve any particular material build up and flow problem. The Primasonics system significantly aids material flow and eliminates particulate build up within a wide range of industries and process applications. This non-intrusive, affordable technology increases the efficiency of process plant, provides improved thermal conductivity, prevents material blockage and removes particulate build up wherever ash, dust, powders or granular materials are processed, generated, stored or transported. Bulk Materials Handling recently fitted two Primasonic Units in a wood burning boiler on a project in New Zealand. Prior to installation, the boiler tubes needed to be cleaned every ten days, shutting down the plant for ten hours each time. Cleaning is now no longer required for months at a time, saving the Company money in down time & labour.